High pressure in swimming pools is something we hear about quite frequently. We get tons of phone calls, emails, chats, and even questions on our new INYO Pool Forum specifically on how to reduce high pressure in your pool system. There are several high-pressure scenarios that can arise on any day for a number of reasons. Each pool setup is different and therefore variables play a role in determining the root cause. Still, reducing high pressure is a common occurrence that can frequently happen if you’re not careful. 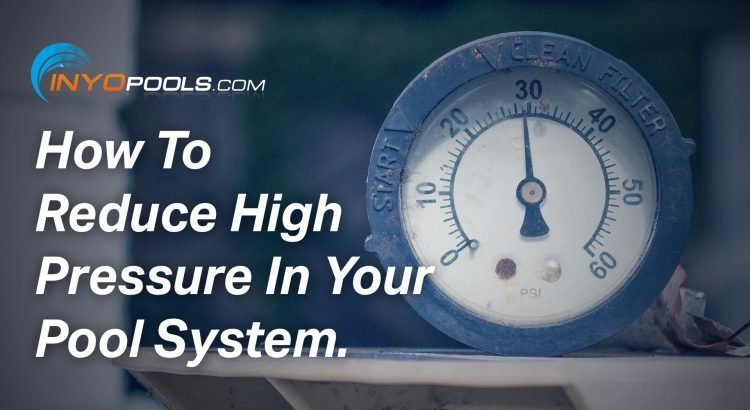 In this blog post, we address what high pressure means to your system, the different ways in which pressure can build, and ultimately how to reduce the high pressure in your pool system. Hopefully, our blog is your one-stop-shop for all of your issues related to high pressure. Do pool filters have a minimum pressure ratings? How Do I Correct Low Water Pressure? One day you come out to look at your pool and you notice that the water flow isn’t what it used to be. Your pool is cloudy or starting to get a tinge of green; your suction cleaner has stopped; your fountains or bubblers are barely generating columns of water; or you feel less water coming out of the return port. What happened and how do you fix it?